Don Pascual is a powerful indigenous shaman from the Q'ero tradition in Peru, said to be the direct descendants of the Inkas. 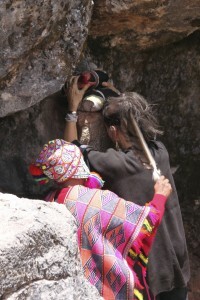 After the invasion of the Conquistadores, these Elders, keepers of the ancient wisdom, retreated into the glaciers where they remained untouched by civilization until 1954 when Don Manuel Quispe had a dream that these traditions had to be shared with non-indigenous people in order for humanity to evolve towards its highest destiny. Don Pascual was chosen by lightning. After his miraculous survival, he was placed in a cave and personally trained by Don Manuel Quispe. He is today one of the most powerful Pacos of this tradition. Over a decade ago, on Christmas eve, I found myself in a head-on collision of two trains in the jungle of Peru. As I was staying in Cusco, waiting for the friend I was traveling with, to recover from three broken ribs, Don Pascual showed up in my life and started initiating me. He asked me to become the Godmother of one of his children. Since then, our collaboration has grown increasingly closer through yearly trips to the Apus (mountains) of this sacred land, and deeper personal inner work in the Q'ero tradition. One day, as he was working on me, he unexpectedly told me to start a school. I am now happy to announce the 1st level (the South) of the Yachay-Munay-Llank'ay School of Shamanic Studies in Phoenix, AZ. Munay is the principle of deep abiding, impersonal love that comes from the heart and permeates all that is…. These 5 days of studies will teach us how to perform ceremonies the traditional way, how to let go of the past, how to start creating our mesa (power bundle) and how to perform healings. To honor the ancient ways, the program is fixed but not rigid, and will very much depend on the needs and levels of the participants. I shall make this ancestral wisdom clearer and more accessible to our Western consciousness, as well as share the ancient myths of creation and the cosmology of the Q'ero tradition. The teachings will be in english, as well as french if necessary. Kindly note that in order to graduate and become a practitioner yourself, you will need to take all 4 levels (South-Nov 2019, West-Spring of 2020, North-Fall of 2020, East-Spring of 2021). in comfortable dark colors fit for both indoors and outdoors. Wear flat shoes. Bring a fabric bag, a pad of paper, a pen as well as a rattle/flute or drum if you have one. I suggest you google: Ahwatukee Foothills Vacation Rentals (zip code 85045). Renting a little house which you can share with other students, will be cheaper than staying in a hotel. But if you prefer a hotel, La Quinta on Chandler is a nice, clean, comfortable, medium priced option: http://www.laquintaphoenixchandler.com. I also strongly recommend renting a car. Nothing is at walking distance in Phoenix and even though the bus system is very well organized, you will be happier to be more independent. I suggest car pooling and sharing the expenses with other students. I shall be providing tea, coffee, cookies and high frequency water. In order to not break the momentum of the teaching, organic, lunches will be available for an extra $88 for the 5 days, delivered to the venue. You will get to choose from the menu of The Perfect Pear Bistro, a wonderful organic little restaurant with a wide selection of delicious, healthy food. Looking forward to journeying soon with you!